When they are just about ready to spin, having emptied out any undigested food, the worms are dropped into a solution of vinegar and salt. There are various instructions on how salty to make it, but one source says that it’s basically as much salt as will dissolve, so that’s what I did. The worm floats in the middle of the solution, which is kinda cool looking. The worm’s head is to the right. I’ve made a small incision in the back, right behind the head. The silk glands practically pop out. 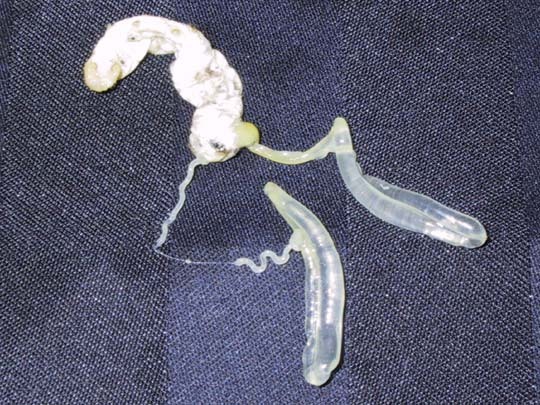 They feel soft, slick, and slightly rubbery – like cool hot glue. I’ve always heard that the silkworm at the final stage is mostly silk – but it sure makes it dramatically clear when you see the silk glands separated out like this. 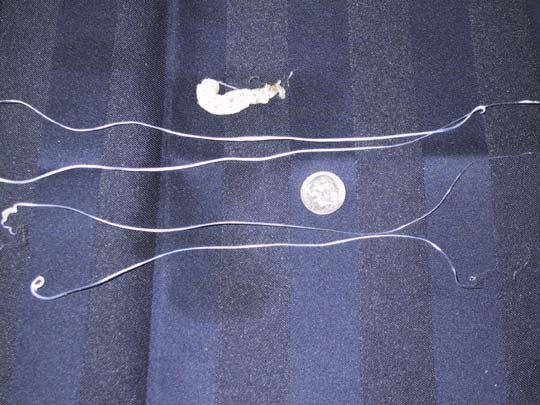 Each gland can be gently tugged and pulled out into a single strand, about 18 inches long. I’m not good at it yet, so I broke each strand into two by tugging it wrong. 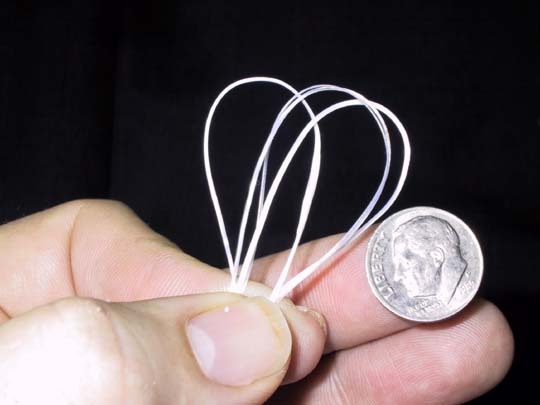 It’s strange, how the strand has a pre-set size – you can definitely tell when the strand is stretched and won’t stretch any more. The stretched strands feel a lot like animal sinew. At this stage, they are whitish and opaque. After drying, the strands clarify. I can see why a lot of the old fly-fishing gut was called “mist colored” – this has a slight blue-gray cast, but is clear like nylon monofilament line. If somebody handed me a strand of it, I would automatically assume it was plastic; they don’t feel at all like silk. That’s cool. I love reading your posts… I always learn something new! Now, why would you do this are the worms at the end of their life at this point, and how long do they tend to live? Another question how much silk can one worm produce in it’s lifetime? Bug guts! This is all fascinating. You must have incredible patience. :chuckle: If anybody told me that I had to sit and do a thousand of them, I’d go nuts. But one (or even ten) is fascinating. I have good patience for tedious stuff, as long as it’s moving along or constantly different. If I have to do the same pattern repeatedly, etc., I don’t have that particular kind of patience. The worms each produce only one cocoon worth of silk. 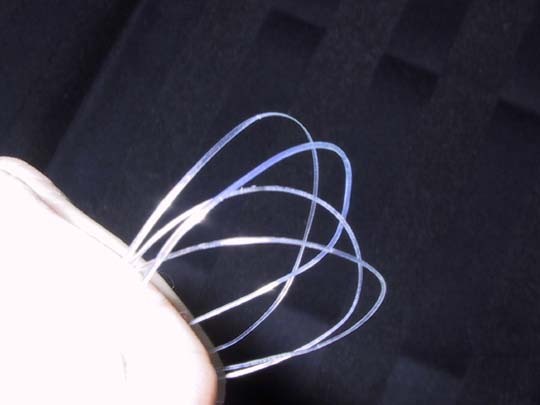 You do this in order to harvest a stronger, sturdier smoother thread than anything you can make by reeling. The worm is not close to the end of its natural cycle; it would normally make its cocoon, pupate, emerge as a moth, and breed before dying. The worms live all winter as eggs, about a month as caterpillars, two weeks in the cocoon, and about half a week as moths. Thank you for that it was very informative. Now do you allow them to cocoon, pupate and breed so that you perpetuate your silk producers? It’s kind of like any crop… you take a certain percentage of the best and finest, you use those for “seed,” and you process the rest for use. Out of each batch of a thousand cocoons, I save 20 or so. hmmm — I hope someone does that to me when I’m dead. I can only hope that you don’t die by drowning in a vat of salty acid. Hmm ..just when you think you’ve seen everything on lj. 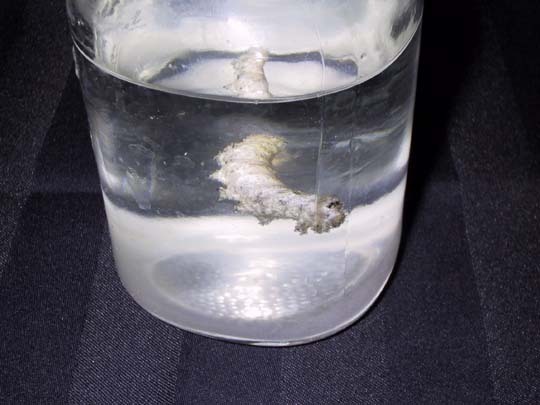 BTW – I believe the salt/vinegar solution is to dehydrate the larval body. Good work – btw are there any good refs on all of this? The salt/vinegar also changes the silk chemically; I tried one without the pickle, and the silk didn’t elongate smoothly and broke easily. There are a lot of references; the best one that I’ve found is online, and I can’t find the d*mned thing. 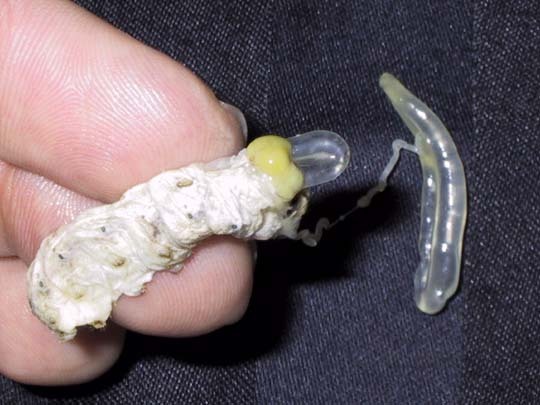 It’s a fly-fishing site, and this guy actually raised his own silkworms to try it out. He also has a PDF of a National Geographic article about it. If I find it, I’ll let you know. That’s fascinating. I want to go off and figure out how the salt/acid mizture could change the silk gland now. I assume that the aid would tenderise the protein, making it easier to stretch. This was a truly interesting photo essay – thanks for sharing. I’m amazed at how the silk changes its character once dyed. The worm produces natural acids during its own spinning process, too – silk is naturally at home in a slightly acid environment. The gland was softer without the soak; the soaked one was tougher, but held together better. I’ve also wondered if this would react to degumming – or if it would etch the surface. As it is, it’s very glassy smooth, just like heavy weight nylon monofilament. There were special tools for twisting or braiding silkworm gut; I’m intrigued with the idea, but don’t have any project ideas in mind… yet! Also, click through and view the National Geographic article – it’s got lots of photos. Note: the silk is yellow in them, because of the sericin; some varieties of Bombyx mori produce yellow silk. Hello mistor, i’m hiro. I’m interested in why you’ve added me to your friend’s list. I was just going through mine and noticing people who’ve added me. I’m Michael. One of my LJ friends (I don’t remember who) posted a link to your journal, referencing your trip drawings and sketches. I enjoyed the cartoon style explanations, and your sense of humor, but especially loved the exquisite drawings of a couple of the people. I draw too, although I haven’t been doing any drawing lately, focusing instead on silk work, weaving, etc. This is for when you have the long rope with all the little strings and hooks hanging down, isn’t it? This is for an application specific to fly fishing, and it’s old-skool. The line is made of lightweight braided silk (different stuff from this) and designed so that it sinks in the water; the leader is made of silkworm gut, and it connects the line to the hook. The fly itself, floats. So it was essential to have something clear, that the fish doesn’t see, between the fly and the line. That’s where this goes. Make sense? I’ve never done it, just read a description, after I decided I wanted to figure out how the gut part worked. maybe you’d be interested in some of my prints then, there’s a link to them in my most recent post. thank you for the compliments. Good to have an answer. Wow, am I ever glad I got to see this! Really. Bug guts are my kind of thing…and we are a fishing family, so the fly fishing info is interesting too. I’ve taken the time to ramble through your journal and i’m facinated. I’ve got a thing for Lepidoptera, so i’m glad we found each other. THANKS INTERWEB.